After looking over ISTEP scores from last spring, and Acuity trends from this fall, I noticed something that confirmed some of my wonderings over the past couple of years. Our reading scores consistently start off strong and steadily decrease as the students get older. I have spoken with educators from other districts and discovered that our system is not unique in this. I have several theories on the “why” behind this decline. Elementary teachers have students all day. They know the home life, personal interests, and educational background of each student. They have time to read aloud to the classes, and offer independent reading time each day. They can easily integrate strategies they are teaching during reading into social studies, math, and science. Writing and reading aren’t separated, but united because, really, they are intertwined. Our elementary teachers use a Reading Workshop framework which also allows them the opportunity to teach each student at their instructional reading levels in small groups, and confer one-on-one with each student on a regular basis. Top that all off with the fact that elementary students largely still enjoy school and work to please their teachers. As the students get older, teachers have less face time with them. Often they move from teaching the child, to teaching the content. This isn’t always what they want, but feel so constrained by standardized testing requirements and 50-minute periods. At the same time, kids become more involved with activities outside of school giving them less time to read for pleasure at home. Reading in school becomes less personalized and differentiated, and more about covering standards. Case in point: My daughter says to me the other day, “Mom, reading used to be my favorite subject in school, but I hate it now.” Alarmed, I asked her why. Her response, “All we do is take tests.” Ugh – knife to the heart of this educator and book lover. I know she doesn’t just take test after test in class, but that is how it feels to this student. Reading for enjoyment at school is gone. Enter the MCS Reading Initiative. 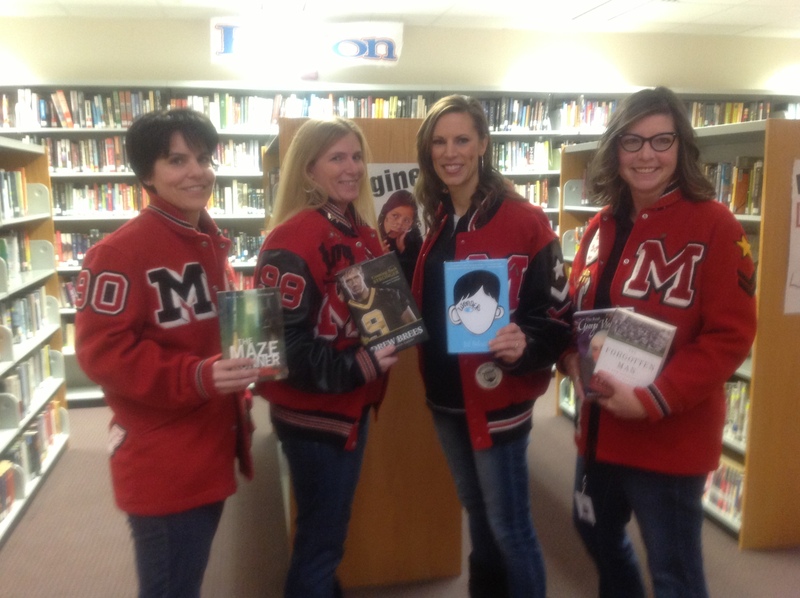 I’m teaming up with our district’s media specialist to try to stop this trend. Our initiative is district-wide (actually moving into an entire community event tapping into resources at the public library, Manchester University, local businesses, and area retirement homes). Our big focus, though, will be in grades 7-12 since this is when we really see the interest in reading take a nosedive. The initiative is multi-faceted, and in the beginning stages, but I’m excited by the possibilities. I’ll keep you posted. In the meantime, start reading something if you’re not already. Anything. It all counts. What are you reading now? This entry was posted in Education and tagged #edchat, reading. Bookmark the permalink. 1 Response to What are you reading now?